cherry cream cheese hand pies — Mel bakes things. For some reason or another, a lot of people I know seem to dislike pie. Usually, it's for one of two reasons: one, people don't seem to enjoy cooked fruit, and/or two, nobody wants to be bothered with making pie crust. I don't understand you cooked fruit haters. I will eat just about any fruit, pretty much regardless of preparation. I'll even eat durian, world's most hated and possibly stinkiest fruit. Funny story about durian...one time, Brandon's cousin brought durian to work for lunch, and they ended up evacuating the building because they thought there was a gas leak. Yeah, it's that stinky. I totally understand the hatred of making pie crust, though. It's annoying. And store-bought pie crusts are never really all that tasty. So then you end up just sort of...avoiding pie. This recipe, though, will solve your pie crust problems. It's insanely simple. I even cheated a little (okay, a lot) and used my food processor for the part where you have to cut in the butter. The best part about this recipe is the adaptability factor. Use whatever fruit is ripe/in season. Change up the citrus to match. You could even substitute the sweetened cream cheese with chocolate, if you wanted to. Or leave it out altogether. **the amounts listed here are for the full recipe. I halfed everything when I made them, so that I only ended up with about 12 pies. Additionally, you'll see that Deb suggests a square, fluted cutter, however, I used a round biscuit cutter for mine, which worked just fine too. Make pie dough: Whisk together flour, zest, sugar and salt in the bottom of a large, wide bowl. Gently stir in 3/4 cup buttermilk with a rubber spatula, mixing it until a craggy mass forms. Knead it with your hands just two or three times to form a ball. If it doesn’t come together, add remaining 1/4 cup buttermilk, 1 tablespoon at a time, until it does, then gently knead again. Divide dough in half. Wrap each half in plastic wrap and flatten a bit, like a disc. Chill in fridge for at least an hour or up to two days or slip plastic-wrapped dough into a freezer bag and freeze for up to 1 to 2 months. To defrost, leave in fridge for 1 day. Make cherry filling: Place cherries and sugar in a small-to-medium saucepan and stir to combine. Cover and cook at medium-low heat for 15 minutes, no need to stir. Increase the heat to medium, remove the lid and cook for another 10 minutes, until cherries are broken down and ideally thick enough that if you run a spoon across the bottom of the pot, you can see a trench quickly form and disappear. Spread mixture on a large plate in the fridge or freezer to cool quickly, then scrape into a bowl. Keep cold until needed; it will be thicker and easier to “scoop” onto the pie bases. Assemble pies: Heat oven to 400 degrees. Line two to three baking sheets with parchment paper. Beat your remaining egg and 1 tablespoon water and keep aside with a pastry brush. If your dough becomes soft at any point in the assembly process, slide the dough squares onto a prepared baking sheet and freeze them for a couple minutes until they’re semi-firm again. Brush half the squares very, very lightly with the egg wash (seriously, VERY lightly or your filling will spill over the sides); these will be your bases. Cut a small vent in the other half of the squares; these will be your lids. In the center of each egg washed square, put a small dollop (a measured teaspoon) of cream cheese, then cherry filling on top. Top each filled base with a vented square. Press outer edge of top and bottom all around to seal with your fingertips; a fork will work as well. Transfer pie to a baking sheet, spacing 1-inch apart. Brush the tops with egg wash and sprinkle generously with coarse sugar. Repeat with remaining dough, including second half from fridge, and fillings. Bake for 15 to 20 minutes, until puffed and golden, and even more brown at edges. Transfer to cooling racks and cool to room temperature before serving. 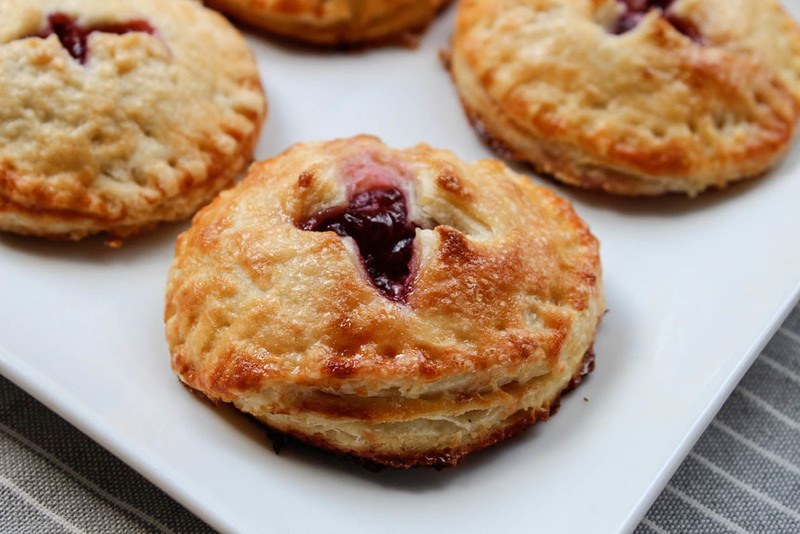 For the original recipe, visit Deb's blog here: Smitten Kitchen's Hand Pies. She's got a lot more photos that will help you see how this whole delicious mess works.